Home » NAZI UFO -Top secret 1938-1945. New Swabia (German: Neuschwabenland) is an area of Antarctica between 20°E and 10°W in Queen Maud Land. It was explored by the German Antarctic Expedition (1938–1939) which discovered ice-free areas with warm freshwater lakes and signs of vegetation, but Germany made no FORMAL territorial claims. Outpaced by the industrial war machine of the Allies, the NAZI elite had to give up Germany in 1945 to stop the perpetual carpet bombing of it’s civilians. There are rumors that Germany had developed the atomic bomb before the Allies, but Hitler refused to use the weapon of mass destruction against entire Aryan populations. Instead, backdoor deals were struck allowing an exchange of technology, for the safe escape of hundreds of thousands of Nazis into South America, or employment in NASA (see Operation Paperclip). The Nazi elite took refuge in their Antarctic fortress. Hitler’s body was never recovered, and no NAZI party member ever officially surrendered. This is why Secretary of Defense James Forrestal sent a naval task force to invade Antarctica, including Admiral Nimitz, Admiral Krusen and Admiral Byrd, called “Operation Highjump”. Over 4,500 military troops from the U.S., Britain and Australia consisting of three Naval battle armadas departed from 3 seperate locations in 1946. Admiral Byrd’s command ship led the attack, the ice-breaker “Northwind,” and consisted of the catapult ship “Pine Island,” the destroyer “Brownsen,” the aircraft-carrier “Phillipines Sea,” the U.S. submarine “Sennet,” two support vessels “Yankee” and “Merrick,” and two tankers “Canisted” and “Capacan,” the destroyer “Henderson” and a floatplane ship “Currituck.” Byrd was given unlimited funding and 8 months to complete the operation. It was a bloodbath. Upon returning in disgrace from a humiliating defeat in just under 2 weeks, Admiral Byrd stated that it was now: “necessary for the USA to take defensive actions against enemy air fighters which come from the polar regions”. 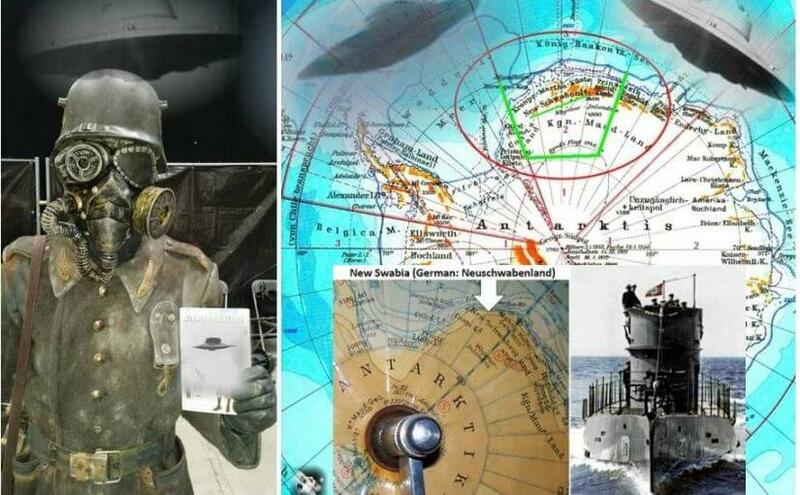 The Antarctic Nazis were able to develop their spacecraft (Vril) far in advance of anything possessed by the U.S., and swiftly defeated the massive “post WW2” military attack by Allied forces who fearfully retreated after suffering substantial damage and heavy casualties. The Rothschild/Rockefeller controlled media has promoted a false narrative concerning the events of WW2 for the past 70 years. While the United States government continues to suppress this “Vril” free-energy technology, maintaining the status quo of our oil-based globalist slave economy, the breakaway Aryans have expanded an enormous secret space program and does not use/need fossil fuel (oil).